It’s part of a report by the Ellen MacArthur Foundation which is pushing for companies and governments to do more to tackle plastic pollution. In total, 150 companies are pledging to reduce their plastic usage as part of the campaign. But some companies including Pepsi, L’Oreal and H&M haven’t said how much plastic they use. It’s hard to visualise what three million tonnes looks like. But everyone can picture a blue whale. Now picture 15,000 of them. That’s roughly three million tonnes. In 2018, the company announced a pledge to recycle a used bottle or can for each one the company sells by 2030. 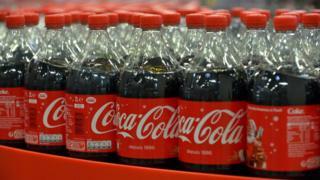 Coca-Cola markets 500 brands of fizzy drink, juices and water and says it will also work towards making all of its packaging recyclable worldwide. In this report, 31 companies – including Mars, Nestlé and Danone – reveal how much plastic packaging they create in a year. Colgate: 287,008 tonnes in 2018. Burberry: 200 tonnes of plastic in a year. Companies are trying to be more open about how much plastic they use – and how much waste they create. In February 2019, Nestle got rid of plastic straws from its products and is using paper ones instead. Burberry was criticised in 2018, when it said it destroyed unsold clothes, accessories and perfume worth £28.6m to protect its brand. It’s now stopped the practice. 150 companies have signed up to be part of The Ellen MacArthur Foundation’s commitment to reduce plastic pollution.